There are so many reasons I love Nicaragua. From day one of my first visit, I felt at home in that way many travellers experience: sometimes a place just clicks. Nicaragua is a beautiful country, full of vibrant colors, delicious food, friendly people, unique natural wonders, and millions of photographic opportunities. From volcanoes and cloud forests to centuries-old cities filled with colonial architecture, Nicaragua offers unparalleled experiences. Currently, it is one of my top five favorite places in the world; my husband and I even intend to move there in the not-too-distant future. Nicaragua, idyllic in so many ways, has its detractors like anywhere else. Along with many developing countries around the world, Nicaragua a large number of uncared for animals. Dogs roam freely in cities, small towns, on beaches, even on the islands. Wherever you go in Nicaragua, there seems to be at least one street dog in sight at all times. For as long as I can remember, for better or worse, my life has been filled with dogs. I am that girl who always hangs out with the dog in the room instead of the people. Currently, I am the mother to a 12 year-old curmudgeonly pitbull who I like better than most people. My dogs live and have always lived in relative luxury; plentiful food and water, stuff to chew on, long walks, a comfy bed to sleep in, and a stable, loving home. Even Winkie, my abysmal childhood terrier who would fight you for an uncooked noodle and leave a trail of snot on every wall, had a cushy life. She was smelly, loud, food obsessed, and completely devoid of affectionate instinct, yet we happily had her as part of the family for all of her seventeen years. With that type of animal nurturing background, you can imagine how I felt when I first saw the street pups of Nicaragua. This issue is tough one for many animal loving international travellers. There are still many places in the world where animal welfare isn’t protected by law. We all feel that familiar pang of guilt and concern when we see a too-skinny, mangy pup. For travellers hoping to see the best in a place and have nothing but positive and uplifting experiences, the idea of animal negligence is a huge detractor. It works against the spirit of exploration, ripping you out of the open minded experience you’ve been having, inspiring you question, judge, and compare. I have even seen several threads in forums on travel sites over the years suggesting that maybe it is better to avoid travelling to countries with large stray animal populations because they are “depressing”. At first, I was very bothered by the dogs’ presence, even distracted by it. I would go on an ethical spiral of wondering and worrying what life was like for them, concerned not just for one individual or two, but for all of the dogs I would see over the course of a day. After the first few days in Granada, I saw many of the same dogs over and over again in the same places. They had habits and routines just like domesticated dogs. They knew how to survive, manipulating tourists and locals alike for food and attention. When it comes to traffic and horses, most strays have street smarts far beyond what my pampered indoor dogs have developed. There are vast differences between the cultural position of dogs and cats in the United States and Nicaragua. In the US it’s common for a dog to live most of its life indoors, eating in our kitchens and sharing our couches and beds. We spoil our fur-babies in a way that is not the international norm. For many Nicaraguans, the idea of letting a free range dog into your kitchen or bedroom is not a normal routine. In a society where many people ride to school in horse-drawn carts, animals are still a part of the workforce and aren’t anthropomorphized in the same way. Nicaraguan dogs may not get birthday parties, grooming sessions, or bi-annual vet visits, but when the street pups are left to their own devices they coexist easily with the daily flow of things. They know where to find food and water. They run in packs and get to wander freely. They take long naps in the shade just like any other dog. They play, hunt lizards, and swim in Lake Nicaragua. To travellers considering avoiding a place like Nicaragua because of its population of strays, I would submit that ignoring a problem won’t help solve it. Tourism dollars and international support of NGO’s like Association for Animal Welfare in Nicaragua help solidify infrastructure and care for the dogs. Proactive tourists who want to personally make a difference can even adopt a dog in need of a home when they leave. 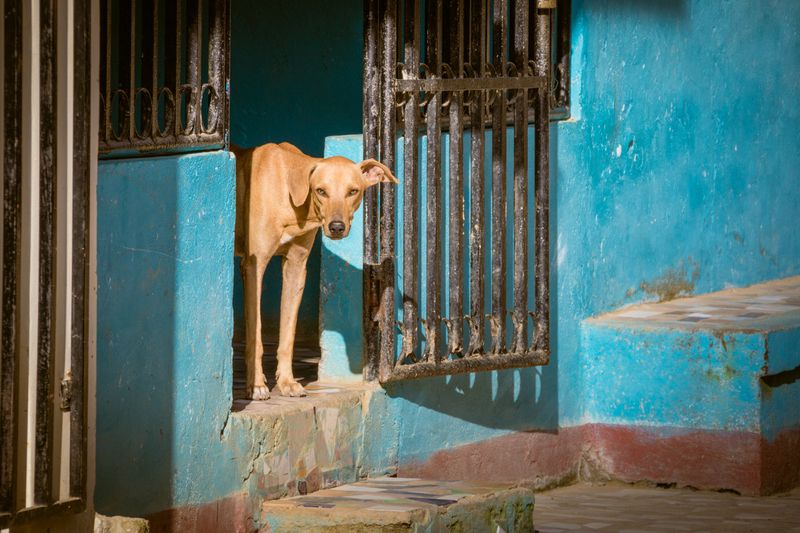 More and more programs are expanding in Nicaragua to provide veterinary care and spaying all over the country, and the government recently passed new legislation to dictate a humane standard of treatment for animals. They are still in the process of instituting the changes, but it seems to be a start of limiting the problem. When I encounter street pups now, I try not to worry or wonder. Instead, I turn to my camera. For decades, photography has been a powerful tool for social change, and this is another prime example. I photograph strays to capture their experience and perhaps elicit interest in helping to protect and care for them. I photograph them to celebrate another kind of local living life on their own terms and embodying the relaxed pace of Nicaragua. They add interest to travel photographs, telling the candid story of a country that is resurrecting itself from political turmoil and putting itself on the map for photographers and travellers worldwide. Life is in the process of improving for generations of animals in Nicaragua and we have the unique opportunity of being part of that change. I enjoy having indoor, spoiled pups to love at home, but I also have sweet free range pups to love when I travel. In either case, I’m happy to throw a stick, give them food, and offer some scratches in all of the usual favorite places. Jordana Wright is a Chicago based photographer who specializes in fine art, food, wedding, and portraiture vineyard, resort, and luxury lifestyle photography. When she is not actively photographing for clients or working on personal projects, Jordana works with underprivileged youth as an Instructor and Mentor of Fine Art and Photography in the Chicago area and enjoys documenting her travels. Follow Jordana Wright on her website, Facebook, Instagram, and Twitter. I agree with Jordan, it is difficult to witness the number of stray dogs in Nicaragua. I first visited in 2014 and found myself crushed with emotion for all the dogs that wandered the streets. And true, as stated in the article, the strays were everywhere. I was told to ignore them, not to feed them, and to wave them off. I abided by those instructions, although reluctantly in my heart. In 2015 my spouse and I moved to Jinotepe in the state of Carazo. Now I was faced with the daily reminder of the strays. What I observed initially were dogs that looked most like Jordan’s photo of the tan dog in the doorway of the blue house. (see article) That image is the iconic Nicaraguan dog. I first judged those dogs as having less self confidence than a rock, always slinking about with their long tails hanging between their legs. Over time I grew to appreciate their cleverness, their ability to survive, and the incredible ‘street smarts’ that they had developed. Jordan spoke of that very thing as well. While we lived there last year I got the opportunity to work with my neighbors family dogs and teach them how to train their dogs in basic commands. It was a highlight of my day to spend time with the kids and the dog, all of us playing together. Please visit Nicaragua. It is a beautiful and rugged land with tremendously generous and likable people. The efforts being made to help both pet dogs and strays is in its infancy there and needs support. Thank you Jordan for a well-written and realistic article. I appreciate it greatly.